Just realized I buried John's find in the post I wrote today on Pakistan. I blame this oversight on the weather. It's 63 degrees here in Washington. I'm going out to play now and probably won't return until the end of the week or whenever the temperature drops again. Wikileaks plus first disbursements from 2009 US aid bill for Pakistan already under scrutiny for graft. Senator Richard Lugar please take note. Last week Michael Wright prodded and poked Pundita into explaining, in paint-by-numbers fashion, how ISAF can wrest a real victory in Afghanistan and why the best approach the USA can take to Pakistan is as little as possible. See the forthcoming post -- working title: What would Genghis Khan do? How ISAF can beat the enemy in Afghanistan. The post will be published whenever I finish transcribing and editing the conversation, which I hope will be sometime on Sunday, December 5. The On Park Street blogger, posting yesterday at Chicago Boyz, reported learning from Senator Richard Lugar's website that in his capacity as the ranking Republican Chairman of the U.S. Senate Foreign Relations Committee he "exercised close oversight of U.S. policy in Pakistan and participated in more than 15 hearings related to ongoing affairs in the country from 2003 to the present." The Wikipedia article on Lugar mentions that he along with Senator Joseph Biden, his Democrat counterpart on the committee, were awarded the Hilal-i-Pakistan (Crescent of Pakistan) Award from the government of Pakistan "for their continued support of the country." Given all the billions USD that Lugar and Biden (the original co-sponsors of the Enhanced Partnership with Pakistan Act of 2009) were proposing to throw at Pakistan on top of the $15billion in aid heaped on it since 2001, one might have hoped the award was accompanied by a brass band and a banquet. In re: WikiLeaks - why was a private first class [Bradley Manning] with no known worth in connection with State, sitting in Baghdad, able to access information that was way, way over his responsibility? Now it's all in WikiLeaks and the entire planet has it. Extremely insulting, and dangerous to the American people. Review: ranking member of House Intell Committee flew to Yemen for real-time info on US policy; was refused; data were that AQAP was bombing and it was being disguised as Yemeni activity. [John Batchelor's comment] To deny the people is to deny the democracy. By the "the people" John means not the public but the representatives of the American people, the Congress. So the bizarre way in which access to the diplomatic dispatches was meted out helped blind U.S. decision-makers just as surely as turf-protecting at government agencies had done in earlier years -- a problem that the shared network was meant to solve! That, I submit, is the biggest surprise to emerge thus far from the Wikileaks documents dump. Yet the revelation doesn't fully explain why the U.S. military and executive and congressional branches have consistently made bad calls on Pakistan because this has been going on for more than a half century -- ever since the U.S. first became involved with Pakistan. Yet these bad calls weren't seen as such until NATO floundered in Afghanistan. That finally put a crimp in the style of Washington's anti-Russia crowd but over decades the crowd and its counterpart in Europe looked the other way while Pakistan ran riot because they saw the country as a weapon first against the Soviet Union then against Russia. Joe Biden, the original co-sponsor of the Enhanced Partnership with Pakistan Act of 2009, has always been part of the 'Get Russia' contingent in official Washington. I am not sure about Lugar. But one only needs to read his profile at Wikipedia or the transcript of his recent discussion at the Council of Foreign Relations, to see how he has prioritized his work on defense threats during his decades in Washington. This observation isn't a criticism of his focus on securing Russian nukes and reducing the number of nuclear weapons but that area of defense is clearly his greatest area of expertise, not Pakistan. Lugar's situation is the story of all U.S. Members of Congress; they are pulled in several directions, so it's always a great accomplishment when a congressional can become expert in just one area of policy. That, plus the hyphenated aspect of how Washington perennially views Pakistan has meant there are no Pakistan experts in the Washington policy establishment. It's never been "Pakistan" in Washington's view. It's been Pakistan-Cold War, Pakistan-Afghanistan, Pakistan-Russia, Pakistan-War on Terror -- and since 2009, Pakistan-India. Where is our aid money going? How are we effecting these changes in Afghanistan that we want with regard to children or women or everybody who has been in the dispossessed category? And the -- those are going to be more and more difficult issues to answer. It's the same over on the Pakistani side. You know, I've -- my name is attached -- first of all it was the Biden-Lugar bill, then it became the Kerry-Lugar bill, then the Kerry-Lugar-Berman bill. But in any event, the excitement of Pakistan at the time was that $1.5 billion would be allocated to Pakistan for a five-year period. And that was magic, five years; the thought was we'd always leave by the end of five months. But we would be committed to thinking through the basic institutions of the country for that period of time. However, as Secretary Clinton found when she went over, many of the military people in Pakistan took a very dim view of that, and they said, you're beginning to get into our territory of decision-making. And so now most of them have relented. But the facts of life are that very little of the first 1.5 billion (dollars) has been spent, for the first year. And some of it has been suggested for the flood relief. The Pakistanis have said, no, we really want to do the schools and the basic institutions; let's have some other money for the flood. Well, fair enough, but any money getting there that is -- that is supervised, that has some credibility with regard to American taxpayers as to how it's being spent, is sort of hard to come by. Islamabad, Nov 25 (IANS) Pakistan's National Accountability Bureau (NAB) has decided to investigate reports of alleged corruption in the funds being disbursed to NGOs for development projects under the Kerry-Lugar bill. A two-member delegation of the US Agency for International Development (USAID) met NAB chairman Justice (retd.) Deedar Hussain Shah Thursday and 'requested him to look into the matter to ensure transparency in the development schemes aimed for the betterment of Pakistan people'. The US government has already lodged formal complaints with NAB regarding financial embezzlement in local NGOs and the association of some US nationals with them. Justice Shah assured the US officials that "complaints will be thoroughly investigated and accused will be brought to book". The Kerry-Lugar-Berman bill, signed by US President Barack Obama in October 2009, envisions providing non-military financial assistance worth $7.5 billion to Pakistan in five years. Much of this aid was to disburse through American NGOs for development projects at mass level in Pakistan. There have been reports that some local NGOs have used US citizens as front men while some others have pooled with the non-governmental organizations in US to squeeze funding. This is against the spirit of the funding agreement and prompted the US authorities to lodge complaints for a formal probe. Now I'm not going to sit here for another year on this blog and keep finding different ways to give the same recommendation. If Washington can't fathom the reasons for the simple injunction, "Stay out of the bazaar," then bitter experience will continue to be the only teacher of the American military and civilian government. From queries I've received the cognitive stumbling block about my advice seems to be that tending to one's own business can't be that simple a solution to the Afghan War. It is that simple. If you need to get from New York to Boston in the fastest possible time, do you route your trip through Bangkok? If you need to go buy milk and bread, do you head for an electronics store? Some do such things; some have great difficulty focusing on any one task. But such people should not be involved in war planning nor in the diplomatic exchanges that support it. That's all; make do with what's available instead of creating a veritable universe of distractions that only cause the years and the body bags to pile up. If ISAF can't invade Pakistan, then al Qaeda on their side of the border is the Pak military's problem; the ISAF problem is to pick off al Qaeda when they step across the Pak border. If Pakistan's government invites ISAF in; if they allow it to fight battles against al Qaeda and give it all necessary help, that's a different story. Otherwise, ISAF should focus on plugging up the holes. Al Qaeda will not spend weeks clambering over remote mountain passes just to blow up a few Coalition soldiers; al Qaeda and Taliban fighters are driving through the border checkpoints, not playing Sherpa. And the USA should lavish all the attention it's been giving Pakistan on Afghanistan instead. That's how the U.S. military will win hearts and minds: just do your job, the one you told the Afghans you were going to do. That's all. There is another way to play it, but that way is not open to Washington because the policy establishment doesn't understand the Pakistanis and has no interest in understanding them. There is no simpatico -- and that's okay because the USA is in that part of the world to fight a war. It stops being okay when Washington tries to beat the Pakistanis at games Americans don't understand. It stops being okay when Americans patronize them. It stops being okay when Americans try to strategize outside their experience. [...] The correspondence [from Jasmine Zerinini, Adviser on international and strategic affairs to the Permanent Secretary for National Defence in the French Cabinet] sheds light on the Pakistan Army’s policies in the Federally Administered Tribal Areas (Fata). [Kayani] is becoming an obstacle to any major change in the country’s policy pertaining to Fata. Zerinini’s correspondence also stated that the West has lost the opportunity to crush the Afghan Taliban with Pakistan’s help. Pakistan the "most bullied US ally"
RAWALPINDI: On the day WikiLeaks released a slew of American diplomatic cables revealing, among other things, tensions between the US and Pakistan over nuclear matters, a top Pakistani military official claimed the country “has transited from the `most sanctioned ally` to the `most bullied ally`” of the US. Detailing frank exchanges between the uppermost echelons of the Pakistan military and the Obama administration, the senior military official listed a catalogue of complaints the `people of Pakistan` have against the US. These include: the US still has a `transactional` relationship with Pakistan; the US is interested in perpetuating a state of `controlled chaos` in Pakistan; and, perhaps most explosively given the WikiLeaks` revelations, the “real aim of US strategy is to de-nuclearise Pakistan”. The official also repeatedly stressed that the `frames of reference` of the US and Pakistan with regard to regional security matters “can never be the same and this must be acknowledged”. Furthermore, the official claimed, the dichotomy between short-term US interests and long-term Pakistani security interests needs to be kept in mind at all times. On Afghanistan, the official suggested the Americans need to “clearly identify and state the end conditions in Afghanistan”. The commander also claimed the lack of clarity on the Americans` part was because “either they aren`t willing to state them (the desired `end conditions`) or they don`t know themselves”. The senior army official had harsh comments for the Afghan government. Recounting the frequent Afghan accusations against this country — Pakistan is keeping the Taliban as `an option`; Pakistan is `shielding the Quetta Shura`; Pakistan is `harbouring and supporting the Haqqanis`, etc — the senior officer responded with a list of Pakistani grievances. The commander went on to argue that while Pakistan could not afford to be in a “state of perpetual conflict with India” and has to “strike a balance between defence and development”, “we cannot afford to ignore our basic defence needs.”In sum, the comments on Afghanistan, India and the US suggest the Pakistan Army`s `India-centric` approach to strategic issues is still very much in place, with only minor adjustments made to accommodate the changed regional security environment in the 21st century. Nevertheless, citing three factors, the official downplayed the possibility of an imminent operation in NWA. First, the official said, South Waziristan needs to be resettled. Second, the country had to prepare for the `serious blowback` of an operation in NWA, which would include terrorist attacks in the cities and a fresh wave of Internally Displaced Persons. Arif Rafiq, Pakistan Policy Blog, and Tom Joscelyn, Long War Journal, in re: Dawn is leaking WikiLeaks: [the Pakistani view is that] US policy is to strip Pakistan of nuclear capacity by producing controlled chaos. US three goals are to denuclearize, demilitarize, and de-Islamicize Pakistan. Meanwhile, Pakistan is trying to delay important maneuvers until the clock runs out on the US in Afghanistan. Everybody is playing a double game: sponsoring jihadist attacks and ostensibly supporting the US. Complicated, multi-sided game. Emir of Qatar says, "The Iranians speak a hundred words; you can believe one" - this can be applied to all the players. Iran calls WikiLeaks documents all a U.S. plot. Six NATO troops killed by Afghan police - at least the fifth time in 13 months that Afghan soldiers or police have turned their weapons on their NATO partners. Previous cases looked like Taliban infiltration. But it was Tom Joscelyn who got off the best line. I don't have the exact quote, but he said in effect that the right approach for the United States in dealing with Pakistan is to learn to play it straight, to speak with complete frankness. Tom is right. Playing it straight is the only way to communicate when you don't know how to bargain by rules that are thousands of years older than yours. Since the 26/11 sea-borne terrorist strikes in Mumbai [in 2008] by the Pakistan-based Lashkar-e-Taiba (LeT), we have had three acts of suspected jihadi terrorism on the Indian territory outside Jammu and Kashmir. These attacks show that the LeT, controlled by Pakistan’s Inter-Services Intelligence (ISI), and its affiliates in India such as the IM and the Students’ Islamic Movement of India (Simi) continue to plan terrorist strikes against Indian targets despite the international surveillance of the LeT post-26/11, when the West realised that the group is as dangerous as al-Qaeda. The LeT and other organisations have not been weakened. Their anti-India motivation remains strong. There has been no dilution in the ISI’s support for them. Their training infrastructure in Pakistani territory is intact. Their propaganda against India continues to be virulent. They are looking for opportunities to plan and carry out more acts of mass casualty terrorism. The failure of the US to pressure Pakistan to arrest and prosecute the ISI officers named by David Coleman Headley has strengthened the ISI’s belief that as long as it cooperates with the US, the latter will continue to turn a blind eye to its use of the LeT terrorists against India. The lack of vigorous action by the US against Pakistan for its involvement in the 26/11 strikes and its disappointing cooperation with India in the Headley case have shown that any high expectations of US cooperation with India against terrorism of Pakistani origin would be an illusion. The US government has targeted a charitable front for the Pakistan-based Lashkar-e-Taiba and three senior leaders of the terror group by designating them as global terrorists. The Lashkar-e-Taiba receives support from Pakistan's military and its intelligence service. Today under Executive Order 13224, the US State Department added the Falah-i Insaniat Foundation (FIF) as a terrorist entity, while the US Treasury Department added FIF leader Hafiz Abdur Rauf, along with Mian Abdullah and Mohammad Naushad Alam Khan, to the list of specially designated global terrorists. The designations allow the US to freeze the assets of the three senior leaders, prevent them from using financial institutions, and prosecute them for terrorist activities. "Few individuals are more integral to LET's fundraising than Hafiz Abdur Rauf and Mian Abdullah," said Under Secretary for Terrorism and Financial Intelligence Stuart Levey. The Lashkar-e-Taiba has launched multiple terror attacks against India, including the 2008 terror assault on the city of Mumbai which killed 165 people, including civilians and members of Indian security forces. Operating in conjunction with the Jaish-e-Mohammed, another Pakistan terror group, the Lashkar-e-Taiba also executed the December 2001 terror assault on the Indian Parliament in New Delhi. In addition, both groups carry out attacks against Coalition and Afghan forces in Afghanistan, and serve as al Qaeda affiliates in the region. Pakistan has refused to crack down on homegrown terror groups such as Jaish-e-Mohammed and Lashkar-e-Taiba, despite their covert and overt support for al Qaeda, the Taliban, and other terror groups. Inside Pakistan's military and intelligence services, which are the real powers in Pakistan, groups like Jaish-e-Mohammed and Lashkar-e-Taiba are seen as 'strategic depth' against India, and are used as instruments of foreign policy. Hafiz Saeed, the leader of the Lashkar-e-Taiba who has been designated by the US and the UN as a terrorist, remains a free man in Pakistan despite openly supporting jihad in both India and Pakistan, and regardless of his group's involvement in the Mumbai attack as well as other terror attacks. Pakistani Army corps commanders, who occupy some of the senior-most positions in the military, openly cavort with Saeed. ISLAMABAD - The United States has renewed pressure on Pakistan to expand the areas where CIA drones can operate inside the country, reflecting concern that the U.S. war effort in Afghanistan is being undermined by insurgents' continued ability to take sanctuary across the border, U.S. and Pakistani officials said. The U.S. appeal has focused on the area surrounding the Pakistani city of Quetta, where the Afghan Taliban leadership is thought to be based. But the request also seeks to expand the boundaries for drone strikes in the tribal areas, which have been targeted in 101 attacks this year, the officials said. Pakistan has rejected the request, officials said. Instead, the country has agreed to more modest measures, including an expanded CIA presence in Quetta, where the agency and Pakistan's Inter-Services Intelligence (ISI) directorate have established teams seeking to locate and capture senior members of the Taliban. U.S. officials confirmed the request for expanded drone flights. They cited concern that Quetta functions not only as a sanctuary for Taliban leaders but also as a base for sending money, recruits and explosives to Taliban forces inside Afghanistan. "If they understand our side, they know the patience is running out," a senior NATO military official said. I invite you to contemplate the kind of NATO official who conceives of the Pakistani military's assistance to terrorism and the murder of NATO troops as a matter calling for patience. Next to that official the fiends in Pakistan's military are as pure as driven snow. North Korea fired artillery toward its tense western sea border with South Korea on Tuesday, killing at least one South Korean soldier, the Yonhap news agency reported. Two civilians and 13 other South Korean military personnel were injured, with three of the soldiers seriously hurt, Yonhap said. A Ministry of Defense spokesman contradicted the Yonhap report, saying that no deaths had been confirmed and that the military was checking on possible civilian casualties. At least 200 rounds of artillery hit an inhabited South Korean island in the Yellow Sea after the North started firing about 2:30 p.m. local time, Yonhap said. South Korea's military responded with 80 rounds of artillery and deployed fighter jets to counter the fire, the report said. The South Korean army also raised its alert condition, the report said. Images of plumes of smoke were quickly broadcast on Yonhap television from the island of Yeonpyeong, with some homes on fire. It was not immediately clear how much damage the artillery had done. The island has a large military garrison. The island has a total of about 1,300 residents, a fisherman who lives on the island told Yonhap. Some residents started fleeing for the South Korean mainland, which is about 145 kilometers [90 miles] away. Other residents were seeking shelter at schools. The South Korean government immediately called an emergency meeting of its security ministers, meeting in a bunker under the presidential residence in Seoul. South Korean President Lee Myung-bak ordered his ministers to take measures against an escalation of the situation, presidential spokeswoman Kim Hee-jung said, according to Yonhap. "Take a stern response and carefully manage the situation from further escalating," the president said. The North Korean fire came as the South's military conducted routine drills in waters off the island, which is about 10 kilometers [6 miles] from the North. The Yellow Sea has been a longstanding flashpoint between the two Koreas, but Tuesday's attack was an escalation in violence. "Our navy was conducting a maritime exercise near the western sea border today. North Korea has sent a letter of protest over the drill. We're examining a possible link between the protest and the artillery attack," presidential spokeswoman Kim said, according to Yonhap. The island is part of a small archipelago about 80 kilometers [49 miles] west of the South Korean port of Inchon, which serves Seoul, and is close to the tense Northern Limit Line, the maritime border between the two Koreas in the Yellow Sea. A South Korean warship, the Cheonan was sunk in the area in March with the loss of 46 lives in a suspected North Korean torpedo attack. North Korean artillery is extremely difficult to hit, because it is dug into coastal cliffs. Though the North has tested its artillery -- and tested anti-shipping missiles -- it has not fired artillery into South Korean territory in recent years. Yonhap television was covering the attack nonstop in South Korea, forgoing other news Tuesday. Meanwhile, state television in North Korea did not mention the attack. South Korea officials said dozens of rounds had landed on Yeonpyeong Island in the Yellow Sea, 50 miles off the South’s northwest coast in an area close a disputed sea border. Other reports suggested as many as 200 shells were fired. The Guardian is live-blogging on the incident; the page automatically updates every minute; last update 7:54 AM GMT. Spoke Evan Ramstad, WSJ, at approximately 130 am [ET] on Tuesday 23 to learn of the artillery attack on the occupied island of fisherman off the west coast of Korea. Houses afire. Casualties. Report of aircraft launched by South Korea. Much excitement in the media and on Twitter account. Does it connect to the ongoing story of the secret centrifuge facility in North Korea? Am told that this is evidence that North Korea is developing a uranium bomb. This is far more useful that its plutonium bomb. Uranium bomb can be miniaturized for a warhead. North Korea succession struggle continues. The incoherence is the story. The North Koreans are now claiming that they fired in response to a live-fire exercise by the South Koreans at the close of a five-day naval exercise in the West Sea. Blame-shifting developing in slow motion. Markets selling off. Much hemming [and hawing?]. The Taliban have already pounced on the comment and rather grandly issued their rebuttal, "Response of the Islamic Emirate of Afghanistan as regards Lisbon Meeting," which boils down to saying they're just gonna wait out the ISAF and that they've already put together a "comprehensive policy for the future Afghanistan," to be inflicted as soon as the troops leave. A survey published late Friday gave a gloomy prediction that most people in southern Afghanistan thought the Taliban would return after NATO troops leave. And what about the July 2011 withdrawal deadline promised by President Obama? I’ve seen some of these stories that have sort of suggested that there is an inherent contradiction between July 2011 and the end of 2014. And I think we have always seen these as very much linked and consistent that you would, as the president articulated nearly a year ago, begin the gradual withdrawal of U.S. forces come July 2011, based upon conditions on the ground, and then, hopefully, move the Afghans into increasing responsibility for their security. I think it’s entirely unknowable at this point. I don’t think anybody could tell you with any credence what the force posture will be four years from now. It’s just impossible to know. It just depends. Like, we don’t know, for example -- here we are nine months out -- less than that; eight months, seven months out from the July 2011 date, and the conditions on the ground are not known to us now about -- you know, for July 2011. So we can’t even tell you, for example, how many forces we estimate will be coming out or reinvested come July 2011, let alone, you know, four years from now. Okay; "aspirational" it is. Now they just need to give it an acronym, unless "BS" (blowing smoke) will suffice. ... NATO and Moscow signed an agreement to expand the alliance's supply routes to Afghanistan through Russia and were expected to set up a new training program in Russia for counter-narcotics agents from Afghanistan and other Central Asian countries; and agree on a program to provide training to Afghan helicopter crews. This doesn't mean NATO is free of the Pakistani military's extortion, but the agreement with Russia puts ISAF in a better position than before. Cynics will say that Russia gave us nothing, that they're getting more support from the United States for their ascension bid to the WTO in exchange for their help with the supply route to Afghanistan. The cynics are wrong. The Kremlin is taking a huge risk in helping because of their country's large Muslim population and the presence of many Muslim extremists in their region. However, such observations do not move the hardliners on Russia, as this editorial at an Estonian news website makes clear. As long as such views continue in Eastern Europe members of the anti-Russia crowd in Washington will continue to exploit them -- and vice versa; there are hardliners in Russia's military that remain very skeptical of Kumbaya with NATO countries and will believe Russia's membership in WTO when they see it. I share the caution about the WTO; even at this late stage in negotiations, during which everything seems Go, I do not think Obama would hesitate to find a stall if appeasing U.S. anti-Russia hardliners in Congress would help his reelection. Yet history is not on the hardliners' side. As early as 2008 Russian President Dimitry Medvedev proposed a security pact to range from "Vancouver to Vladivostok” and at a tripartite meeting in October, France and Germany signaled a keen willingness to work toward a common EU-Russian security/trade area. The initiative is French President Nicolas Sarkozy's brainchild. Sarkozyy is no fool. He saw that American anti-Russia hardliners tried to provoke Russia into a shooting war with the USA in 2008 over Georgia and that they didn't give a damn how much this would hurt Western Europe. I think American machinations in that instance were the final straw for him, as they were for German Chancellor Angela Merkel. There is more good news about NATO-Russia relations to emerge from the meeting in Lisbon. I do not support American involvement in NATO in this era; I remain greatly concerned that it continues to divert too much of Washington's attention to Europe, and at the great expense of America's relations in our own part of the Western Hemisphere. But knowing that no amount of argument will persuade Washington to either become more balanced in its foreign relations -- what seems an impossible feat -- or leave NATO, I'm glad that at least the NATO summit produced some positive results. (Lisbon, Portugal). . . [Russian President Dmitry Medvedev] on Saturday joined a meeting of NATO's 28 leaders – a gesture that marked a sea change for a partnership created after World War II to defend Western Europe against the Soviet threat. The allies opened their summit by agreeing on the first rewrite of NATO's basic mission – formally called its "strategic concept" – since 1999. They reaffirmed their bedrock commitment that an attack on one would be treated as an attack on all. In that context, the agreement to build a missile defense for all of Europe is meant to strengthen the alliance. . . . Russia was receptive but stopped short of accepting a historic NATO invitation Saturday to join a missile shield protecting Europe against Iranian attack. Russian President Dmitry Medvedev agreed to involve technicians in development plans, but did not make a commitment if it becomes operational and warned that Russia might decide against joining the U.S.-led effort if it doesn't feel it is being treated equally as a partner. "Our participation has to be a full-fledged exchange of information, or we won't take part at all," he told reporters after the announcement by NATO chief Anders Fogh Rasmussen. Obama praised Russia's decision Saturday, saying it "turns a source of past tensions into a source of potential cooperation against a shared threat." Rasmussen was similarly upbeat: "We could cooperate one day in shooting down missiles." Two key unanswered questions about the missile shield – will it work and can the Europeans afford it? – were put aside for the present by NATO members in the interest of celebrating the agreement as a boost for NATO solidarity. Medvedev addressed those issues point blank, saying "it is quite evident that the Europeans themselves don't have a complete understanding how it will look, how much it will cost. But everybody understands the missile defense system needs to be comprehensive." NATO says the cost of the system would be relatively cheap when spread across the entire 28-nation alliance – euro200 million euros, or about $260 million, over 10 years. But critics contend that's a big pricetag for Europe, suffering from a debt crisis that has led to higher unemployment while forcing governments to raise taxes, cut services and slash civil servant salaries amid austerity drives for many nations. Obama said the missile system "responds to the threats of our times. It shows our determination to protect our citizens from the threat of ballistic missiles." He did not mention Iran by name, acceding to the wishes of NATO member Turkey, which had threatened to block the deal if its neighbor was singled out. Turkish President Abdullah Gul said Saturday that NATO met his nation's demands and that the agreement "was within the framework of what we wished. We are pleased about this." And France, which had had reservations that the missile shield plan might come across as a substitute from nuclear deterrence, said it too had signed on after its concerns were answered. "France would have refused a unilateral project disconnected from reality, or costly – or if it had been for that matter hostile to Russia or had been a substitute for nuclear deterrence," French President Nicolas Sarkozy said. He noted that no country was specifically mentioned as the object of the missile defense, but added: "France calls a cat a cat: the threat of the missiles today is Iran." Under the arrangement, a limited system of U.S. anti-missile interceptors and radars already planned for Europe – to include interceptors in Romania and Poland and possibly radar in Turkey – would be linked to expanded European-owned missile defenses. That would create a broad system that protects every NATO country against medium-range missile attack. What remains in conflict, however, is the question of the future role of nuclear weapons in NATO's basic strategy. The document members agreed to on Friday says NATO will retain an "appropriate mix of nuclear and conventional capabilities" to deter a potential aggressor. Germany and some other NATO members want U.S. nuclear weapons withdrawn from Europe. On the topic of a U.S.-Russia arms treaty, Obama was backed by Fogh Rasmussen, who told reporters that the treaty, called New START and signed in April by Obama and Medvedev, would improve security not only in Europe but beyond. Ministers from six European countries – Denmark, Lithuania, Latvia, Hungary, Norway and Bulgaria – on Saturday urged U.S. lawmakers to ratify the stalled nuclear treaty, saying failure to do so would be a setback for European security. The pact would reduce the limits on strategic warheads held by the U.S. and Russia and would establish an inspection system. It would be a major setback for Obama if he's unable to get it ratified by the Senate after inking it with Russia's president earlier this year. Do I look like an edible Japanese chestnut? Never before in history has a dog been introduced to the world with such pomp, and never before has a puppy showed such aplomb at being gifted from one head of state to another, and with such unerring knowledge of its best camera angles! And look at the eyes, the eyes! Where is my Kleenex box? Why, every tear-jerker Russian classical literary and musical work is reflected in the puppy's eyes. And there are people who want to name this very operatic dog, this -- this emblem of Russian drama "Balkan" or "Kuri?" A kuri is an edible Japanese chestnut -- somewhat ominously a popular name for dogs in Japan. Bah! [dabbing at her eyes with a Kleenex] Cretins! It should be fairly obvious even to an imbecile that the best name for the dog is "Glinka." [blowing her nose loudly] But no, that might irritate Russia's Communist Party, if one recalls the fate of Glinka's national anthem, Patrioticheskaya Pesnya, which, by the way, was played at Putin's first inauguration as Russia's President. The anthem, a favorite of the Russian Orthodox Church, was short-lived; to keep the peace Putin resurrected a Soviet anthem and gave it refurbished lyrics. Most of the names come from the people and things Russians most commonly associate with Bulgaria: Bratko, Shipka, Theodore (a Bulgarian tsar) and Perets ('perets' is the Russian word for pepper, and bell pepper is widely known in Russia as 'bolgarsky perets' – 'Bulgarian pepper'). Russian-Bulgarian relations were also a popular theme: Borus (a contraction of 'Bolgaria', the Russian spelling of Bulgaria, and Russia), Brin (Bulgarian-Russian initiatives). However, the most popular name in this vein was Balkan. Patriotic names were also common. Suggestions included Ros (Russia is called 'Rossiya' in Russian), Rus or Rossi. The author of the last suggestion explained that it was meant to suggest both the word 'Rossiya' and the name Carlo Rossi, the famous Italian architect whose works adorn St Petersburg and its suburbs. Another suggestion was Nabur, an acronym of the phrase 'nadezhda na budushchee Rossii' (which means 'hope for Russia's future'). Nabur? Brin? Why not then simply name the dog "Generic" or "Bound to Offend No One?" The trouble with the Russians is that they don't know what Russia is. Is Russia Eastern? Western? A patchwork of ethnic clans? This attempt to retreat from confusion is well-reflected in the pedestrian name offerings for Putin's puppy. Perhaps the Prime Minister should turn to Columbia University professor Boris Gasparov for help in naming the puppy. Gasparov, one of the great scholars of Russian and Slavic history, wrote the magisterial Five Operas and a Symphony, in which he interprets Russian cultural and literary history through six of its most enduring classical musical pieces: Glinka’s Ruslan and Ludmilla, Mussorgsky’s Boris Godunov and Khovanshchina, Tchaikovsky’s Eugene Onegin and The Queen of Spades, and Shostakovich’s Fourth Symphony. If the professor would frown on my choice of a name then I challenge him to propose a better one. However, I will close with a plug for my candidate. Next to God, humankind's best friend -- but what about a TSA airport scanner's? And more about Putin and the sheepdog puppy. ... 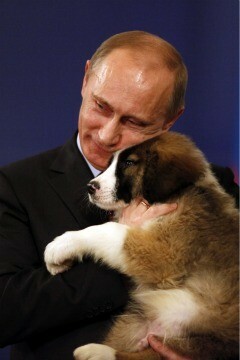 The puppy was carried in by a vast entourage and seemed to take to his new master, giving Putin a lick on the cheek. Some pointed out that the sad-eyed puppy with adorable white socks will later morph into an enormous shaggy guard dog. Putin’s Labrador Connie, graying now, may not know what has hit her. She was shown lying on the sofa as Putin and his wife Lyudmila were filmed taking part in the census in a horribly awkward stunt. Putin joked that Connie was his “first wife” and certainly showed her more affection, giving her a rub as she laid on her back with her paws in the air. But then Labradors like everyone. Duke University's Canine Cognition Center in Durham, North Carolina, is one of the few labs in the country focused on how dogs think. "We're excited about describing the psychology of our dogs," says professor Brian Hare, the lab's director. "Different dogs solve different problems differently. And what we want to understand is: What is it that either makes dogs remarkable as a species or what is it that constrains the ability of dogs to solve problems?" To test the dogs' ability, Hare and a team of graduate students put dogs through a variety of games similar to those you might play with young children. "We don't want to look at cute pet tricks. What we want to know is, what does the dog understand about its world?" Hare said. Hare has been analyzing our four-legged friends for about 15 years. He says dogs have figured out how to read human behavior and human gestures better than any other species has, even chimpanzees. "The way they think about their world is that people are superimportant and they can solve almost any problem if they rely on people," says Hare. Children start relying on adults' gestures when they're about a year old. That's about the same age that dogs start to recognize and rely on humans, too, Hare says. The professor says even though domestication has made dogs smarter, they are not perfect. Still, they're so smart, he says, that they can understand the principle of connectivity. "They know they're connected on a leash and [dogs reason] 'Well, now I have to listen, because if I don't do what you say you can stop me. Where if I'm ... not on a leash, well, yeah, I know the command but I don't have to listen to you now,'" explains Hare. And just like children, dogs also understand that if you turn your back, they can misbehave, especially after their owners have told them not to do something. "Your dog takes the food you just told it not to take, and you're really upset because your dog disobeyed you, and you think that your dog is not obedient. Well, no, no, no, your dog was obedient but it realized that it could get away with it," says Hare. At the end of the day, dogs may rely on humans, but they also use their skills to manipulate their owners and the world they live in. And even though dog owners like to think they're in command, the professor says it may actually be Fido who is really in charge. Breaking News! Uppity responds to the CNN report: "My dog manipulate me? Naaaaaaaah. I walk in the pouring rain in a soaked hoodie, holding an umbrella over her. Nahhhhhhhh." ... After six years and nearly $19 billion in spending, the Pentagon task force assigned to create better ways to detect bombs has revealed their findings: The best bomb detector is -- a dog. The Joint Improvised Explosive Device Defeat Organization, or JIEDDO (the Pentagon should really take a page from DARPA and make catchier acronyms) has been working on this problem for years, but it's only getting more serious. There have been more roadside bombs in Afghanistan in the first eight months of this year than in the same period in 2009, so the work JIEDDO is doing is under extra scrutiny. That made it even more embarrassing when the director of the organization told a conference yesterday that "Dogs are the best detectors." Actually, the Army man in charge of defeating roadside bombs in Iraq and Afghanistan, Lt. Gen. Michael L. Oates, said that the most effective bomb detector is "two men and a dog." Oates's statement might apply in even greater measure to detecting bomb-wearing humans. Dogs sense much more than the odor from bomb chemicals when they sniff a person; they can arrive at a judgment that they've encountered suspicious behavior. I think they're able to clearly communicate their judgment to an observant human companion. To those who say that much 'suspicious behavior' is often a simple fear of dogs -- I think dogs, at least mature ones, can sense the difference between fear of them and fear or hatred of their human companion. In any event the evidence is now clear that dogs working in tandem with humans make the best bomb detectors. So why is the TSA continuing to invest more in very expensive and highly controversial full-body scanner technology? Some light might be shed on this question by noting that politically-connected lobbies and individuals pushed the scanners in the wake of the Underwear Bomber's attempted attack on Christmas Day last year. Perhaps a way airline passengers could legally avoid the scanners and the equally controversial 'intimate' body pat down in U.S. airports would be to wave a copy of the JIEDDO research findings at the airport and demand to be checked out by a dog. Would that work? The puppy has been renamed "Buffy." See this December 14 post for Pundita's anguished reaction to the choice of name and for all the latest Buffy Briefings. Oh right; here's something about the gas pipleine deal. He's also going to make a wonderful companion for Putin's aging Labrador, Koni (or "Connie," as some news reports identify her), who's 11 years old. Paw Nation wondered if the gift, from Bulgaria's Prime Minister Boyko Borissov (a dog lover), was a complete surprise to Putin (another dog lover). I don't think so, because the Bulgarian press couldn't resist spilling the beans ahead of Putin's visit, which was to discuss energy matters and sign an agreement for a joint company that will construct the South Stream pipeline. However, The Paw Nation blogger watched the video of Borissov presenting the sheepdog to Putin and recounted in amusement that there was a look of "kind of panicked surprise" in Putin's eyes at first. It could be that he was surprised by the size of the puppy, which is bigger than many full-grown dogs. According to the Karakachan Dog Association of America website, a full-grown Karakachan can weigh 130 pounds. Paw Nation has the video. ... Bush says he had introduced then-Russian President Putin to his Scottish terrier, Barney, on a visit to the U.S. presidential retreat, Camp David. Putin returned the favor when Bush visited Russia and Putin was giving him a tour of the grounds of his dacha. Bush says he later told the story to the Canadian prime minister, Stephen Harper, who replied: "You're lucky he only showed you his dog." "This is a grossly uncontrolled, uncontained epidemic of cholera that has exceeded public health capacity to investigate and assess every site reported and every sample received." "In Haiti most of the population believes it came from the Nepalese and that the UN will do its best to hide it," said Prospery Raymond, country director of the UK-based NGO Christian Aid. "If it is confirmed to be from them this will be damaging for the UN and their peacekeeping all over the world." There is an additional panic factor because before the outbreak cholera was unheard of in Haiti, which meant Haitians didn't understand the disease and didn't know the protection measures, which in any case are difficult to practice in the DP [displaced persons] camps. While the UN OCHA maps and official MSPP reporting tends to focus on Artibonite and points north, there are other areas routinely not included on the OCHA maps that have reported cholera. We opt on the side of "cholera until proven otherwise" or when political sensitivity is such that full disclosure and transparency allows. Current official stats are more than 14,600 cases and 917 fatalities. In some areas of Haiti, we have confirmation that in-patient statistics are under-reported by as much as 400%. In many areas of Haiti, we are documenting outbreaks that are not being accounted for in the official statistics. There is no question of under-reporting. If we assume the case counts are 1/4 the true community load, then we now have nearly 60k cases shedding pathogen into the environment. We believe the true statistic to be closer to more than 100k based on the degree of under-reporting. It is extremedly difficult to estimate the true scale of this epidemic now. This is a grossly uncontrolled, uncontained epidemic of cholera that has exceeded public health capacity to investigate and assess every site reported and every sample received. Evidence now suggests the epidemic has crossed the border into the Dominican Republic, which was expected. PORT-AU-PRINCE (AFP)--Two men were killed Monday as protesters in northern Haiti clashed with U.N. peacekeepers over a deadly cholera outbreak, and the U.N. said it fired in self-defense on one of the demonstrators who was killed. The body of a 20-year-old man was found in front of a base of the U.N. Mission in Haiti, or Minustah, in Quartier-Morin, on the outskirts of Cap-Haitien, according to local official Bimps Noel, who confirmed the death. It was the scene of violent clashes earlier between demonstrators angry at Haiti's spiraling cholera crisis and U.N. peacekeepers. "At first (the blue helmets) fired to disperse the crowds, and then later, I have the impression they fired on a man," Noel said. The young man was shot in the back, the official said, noting that the "U.N. tanks were hit by stones." "There was a demonstrator who had a weapon and fired at a soldier, and the soldier returned fire in legitimate self-defense," said Minustah spokesman Vicenzo Pugliese. "The soldier was not injured," he said. Another Haitian young man was killed by gunfire on a street in Cap-Haitien, amid the clashes with the U.N. force, a police source said. Protesters in northern Haiti set fire to a police station and clashed with U.N. peacekeepers earlier as anger turned to violence over a cholera outbreak that has claimed almost 1,000 lives. Protestors in Haiti have attacked UN peacekeepers over suspicion that Nepalese soldiers brought the cholera epidemic which has swept the country and killed 1,000 people. Crowds in two northern towns hurled rocks, set up burning barricades and blocked roads to protest the foreign troops and the government's response to the crisis, rattling authorities and the UN in the run to a November 28 election. Cap-Haitien, the country's second city, was this morning cut off from the rest of Haiti after a day of rioting shut its roads and airport and left more than a dozen people wounded. Clashes in the town of Hinche injured seven Nepalese peacekeepers, according to local radio. The US Centers for Disease Control and Prevention found that the strain, which has infected more than 15,000 people and reached all 10 departments, resembled one from south Asia. Haiti's first epidemic in living memory began in the valley a week after the Nepalese arrived. UN officials have admitted problems with the base's sanitation but denied its soldiers brought the disease, which is spread by contaminated faeces. No official investigation into the epidemic's origin has been launched despite appeals from Haitian leaders and foreign epidemiologists. With no previous knowlege of cholera many Haitians are unsure how to avoid contagion. Experts say washing hands with soap, especially after going to the toilet, is the best prevention. Treatment - usually an IV drip and rehydration - is relatively simple and fast and saves the vast majority of those infected. Even so, emergency teams are worried. "If it keeps accelerating we will not be able to keep up," said Francois Servranckx, spokesperson for Doctors Without Borders, an NGO which has treated 10,000 patients at improvised tent clinics. Donors credit the UN peacekeeping force, known as Minustah, with keeping the Caribbean nation relatively stable in recent years despite food price riots, hurricanes and January's earthquake. Many Haitians however brand the blue helmets an expensive and useless occupation force. Haitians are also critical of their government for letting the disease spread from the Artibonite valley to cities where millions live in slums, rubble and tents. "Now it's here and they're wringing their hands. Not good enough!" said Alfred Roberts, a father of two in the capital Port-au-Prince. Could a dragged-out economic crisis lead to world war? I've been sitting on Stephen Diamond's November 6 essay, The Income Statement v. the Balance Sheet: Will the Economic Crisis Unravel the Long Peace? because I planned to write a book in reply but before the days turn into months here are my thoughts about his concern. My problem with his discussion is that he's not factoring in the real story behind the economic collapse. In this he's not alone; only a virtual handful of Americans, most of whom relocated to Canada or Switzerland when Nixon shut the gold window, are aware that since the 1970s the major industry in the United States has been U.S. dollar sales to central banks around the world. The industry is untaxed and run by people who are not elected and thus, are immune to the wrath of voters. This has led to great abuse of the U.S. dollar. Yet the ability of the industry to magically generate billions of dollars without generating runaway inflation insulated the American economy from the worst effects of the onslaught by Japan, Inc. and later from China, Inc. The downside is that the U.S. government's heavy reliance on the industry led to the horribly destructive policy that perpetual debt was highly profitable. It was only a matter of time, however, before U.S. dollar hegemony would be challenged, which led to the joke that Saddam Hussein signed his death warrant when he conspired to accept euros in payment for Iraqi oil. The worst downside of the U.S. dollar industry was that it came to substitute for the innovation that drives the kind of technological revolutions that Steve mentions in his essay, and which allows capitalism to function in a healthy fashion. "King Dollar," as Larry Kudlow likes to call it, became a king with feet of clay. The dollar ceased representing the hard work, ingenuity, and freedom of the American people. It became a symbol for a kind of extortion deal, in which countries that could ill afford it had to keep a large amount of their hard currency reserves in U.S. dollars if they wanted to buy OPEC oil and virtually all other key commodities. The deal began to collapse under the weight of its unfairness, with many oil producers accepting barter or non-dollar payments from the poorest nations by the 1990s, and when a resurgent Russian energy industry challenged OPEC's power. Yet the more the USD industry came under pressure, the more other nations were expected to carry an ever-leapfrogging amount of U.S. debt. There was no way the situation could continue indefinitely and it finally crashed with the bursting of the last financial-markets bubble. I mentioned the key role of the USD industry in some of the earliest posts on this blog and warned that hard economic times were ahead for Americans as the industry ran into more and more obstacles. Yet I also noted that once America had gone through a painful readjustment the society would regain its health -- a true health. The other side of the picture is that some carrying of U.S. debt by other nations is not an unfair burden because it's a de facto tax. Being the world's policeman is an expensive enterprise. That long peace Steve talks about has been mostly courtesy of Uncle Sam the Supercop. If some readers shriek, 'Supercop? What about Darfur?' -- yes, what about Darfur? The USA wasn't going to lead the charge into Sudan because it was already under fire from almost the entire world for the Iraq invasion. But when we asked the African Union to take the lead with Darfur, then came the rattling of the begging bowl, hemming and hawing because no African leader wanted to a invade a Muslim nation, etc. etc. They wanted the USA to play the fool again, so they could blame all the downsides of an invasion on Uncle Sam. The downside to weaning the world from American military protection is the specter of mushrooming small wars that could touch off the kind of situation that worries Steve. There is no easy reply to his worry. But the developing world and 'emerging' economies, in particular BRIC nations, are relatively untouched by the economic crises that spun out from the collapse of financial markets in September 2008. Russia has big economic problems, as does China, but so far these are unrelated to the collapse. That situation would change if the crisis continues to drag out. Again, I think the underlying factor in the economic crisis is a currency crisis. I suspect the latter is the real reason for the hesitation of so many U.S. banks and corporations to part with their big cash positions. If I'm right, then quantitative easing measures won't work. Neither will nationalization of the banks. Bottom line is that there's nothing spookier, as far as banks and big corporations are concerned, than a looming seismic shift in the international currency regime. Gen. David H. Petraeus, the coalition military commander in Afghanistan, "warned Afghan officials Sunday that President Hamid Karzai's latest public criticism of U.S. strategy threatens to seriously undermine progress in the war and risks making Petraeus's own position "untenable," according to Afghan and U.S. officials. Petraeus hasn't outright said he'll resign his position but he's made noises to convey that he's upset enough about Karzai's statements that the thought of resigning crossed his mind. What did Karzai say to set him off? Officials said Petraeus expressed "astonishment and disappointment" with Karzai's call, in an interview Saturday with The Washington Post, to "reduce military operations" and end U.S. Special Operations raids in southern Afghanistan that coalition officials said have killed or captured hundreds of Taliban commanders in recent months. In addition to ending night raids, Karzai said that he wants U.S. troops to be less intrusive in the lives of Afghans, and that they should strive to stay in their bases and conduct just the "necessary activities" along the Pakistan border. "I think it's [Karzai's] directness that really sticks in the craw," another NATO official said. "He is standing 180 degrees to what is a central tenet of our current campaign plan." You goddamn human weathervanes, you're the ones who keep doing the 180 degree turns. You've spun around so many times Karzai now reminds me of K in Franz Kafka's The Trial: it might be something he did but he's never sure what. As President Obama looks to further distance himself from the July 2011 drawdown date and officials insist more and more that the real “transition” to Afghan control will only begin in earnest in 2014, US Special Representative Richard Holbrooke seems to be reading from a different script, or at least one that’s a few months out of date. Speaking today to a group of journalists in Pakistan, Holbrooke insisted that the entire war effort would be over by the end of 2014, with all US and NATO combat troops out of the nation by then. He added that the troops will begin to leave in July. President Obama announced the July 2011 drawdown in December, an effort to underscore to the public that his massive escalation of the Afghan War was going to be short-lived. Officials were rejecting the date as a political ploy within hours of the speech ending, and President Obama himself has publicly disavowed the date several times. Some officials had clung to the 2011 date, at least when convenient, for months after President Obama had abandoned it, but it seems now that officials are fairly unified around the 2014 date as the beginning, not the end, of a transitional phase. Barring the possibility that Holbrooke’s comments reflect a massive, previously unannounced change of thought, it seems that his speech is likely still relying on old dates which were politically useful but have since been discarded. Now how is that you keep blaming Karzai for trying to keep up with a weathervane? First you didn't want him to negotiate with the Taliban. Then you wanted him to negotiate with them and when he balked, you told him you were leaving Afghanistan in July 2011. Then when he reached out to the Taliban and scrambled to get on better terms with Islamabad and Tehran you pulled the rug out from under him again, as Bob Gates and Hillary Clinton assured ABC's Nightline a few days ago that the USA was staying in Afghanistan for many years. But then the magic number of a 2014 troop withdrawal was pulled out of a hat -- by what process of logic only a mad monkey could guess. So now Karzai is scrambling to explain another new reality to Afghans, who thought the USA was leaving in July 2011. His latest statement is clearly his attempt to come up with guidelines for what might be a long U.S. haul in Afghanistan -- a long haul until maybe the next U.S. presidential election or when Bob Gates retires or whatever. Now let me tell you what your idea of war has been since the end of World War Two, when the United States became a superpower. When I was a child I had a cousin who loved to play toy soldiers, so every time I visited I'd play toy soldiers with him. Once he was sick so we set up the battlefield on his bed coverlet. Lunchtime came around and his mother swept aside the battlefield to make room for a lunch tray. When the tray was removed we set up the battlefield again but in a different way because over lunch we'd come up new ideas for the war. That's you. That's your concept of war. You've been playing toy soldiers only with real people. When the game runs into an obstacle you switch out not just the rules of engagement but the idea of the war. When challenged on your weathervane behavior you shrug and say this is the way things are in a democracy where there can be a change in political leadership every four years. No. This is the way things are when the majority of citizens in a nation are so distant from the battlefields, so insulated by their vast power, that hubris is their defining approach to waging war. But that's what leaders are for: to stand up to the crowd when it runs in six different directions. Yet since the Korean War America's ranking political leaders and military commanders have demonstrated time and again they will reduce war to a game with toy soldiers whenever the weathervane of U.S. politics spins. If an ocean of uselessly spilled blood has been the result that's simply a matter for the history books. All this clearly indicates that the United States is a nation that is no longer able to accept the responsibility of leadership in any war waged outside its borders. As for NATO: that's not a defense alliance; that's pretzel psychology set atop a weathervane. I recall a documentary from a few years ago that showed never-before publicly aired footage of the Allied bombing campaign in Western Europe. We reduced that region of the world to a pile of rubble by the time we routed the Nazis. And yet the documentary showed that the attitude of the majority of people under the Nazi heel who were suffering from the bombing campaigns was one of joy. One account I will never forget. A Frenchman told of how his wife cried when they had to leave the house because the Allied bombers were coming near. She was upset at the thought that a prized family heirloom, a chiffonier, might be destroyed. He told her, "Don't weep for your chiffonier! Rejoice that the Nazis are being driven from France!" People are willing to suffer a great deal to be free of tyranny. What they are not willing to suffer, what makes no sense to them, is when the rationale for war is adopted then twisted so it can be easily abrogated. People who do such twisting cannot be trusted; their words have no value, their assurances no coin. So the NATO command should not ask why they don't receive more cooperation from the Afghan people. Will Aung San Suu Kyi be released within the next 48 hours? We'll soon find out, won't we? ... Suu Kyi, who has been detained for 15 of the past 21 years, is scheduled to be released on Nov. 13, according to the terms of her most recent house arrest. The junta hasn’t said publicly whether it will free the 65-year-old Nobel Peace Prize laureate. Suu Kyi’s release and the conditions surrounding it may trigger a review of U.S. and European sanctions against the regime for human rights abuses, including the jailing of 2,100 political prisoners. She plans to tour the country and consider her view on sanctions if freed, Win Tin said. Suu Kyi won’t accept conditions attached to her release, and plans to help investigate charges of fraud during the Nov. 7 election, which was criticized for excluding the democracy activist and other political prisoners, Win Tin said. The poll was Myanmar’s first since Suu Kyi’s party won a landslide victory two decades ago in a result nullified by the junta. The Union Solidarity and Development Party, formed by Prime Minister Thein Sein, won the most seats in the election, according to reports in state-run Myanmar newspapers. Suu Kyi, whose party boycotted the election, will visit supporters around the country if released, Win Tin said yesterday. 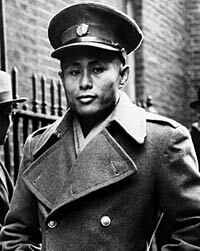 Suu Kyi is the daughter of General Aung San, who led the fight for independence from Britain in the 1940s. She was two years old when her father was assassinated, and spent much of her life outside Myanmar, formerly known as Burma. She married Michael Aris, a scholar of Tibet, and had two children while living in the U.K. Her life changed in 1988 when she returned to Myanmar to nurse her ailing mother and led the struggle for democracy. Myanmar came under military rule in 1962 when General Ne Win overthrew the government of U Nu, the man who succeeded Suu Kyi’s father and presided over 10 years of democracy after the country achieved independence in 1948. Political parties were outlawed in 1964 and the military created a socialist state approved in a 1973 referendum. In 1990, the junta agreed to hold multiparty elections, at the same time starting a crackdown on opposition leaders. 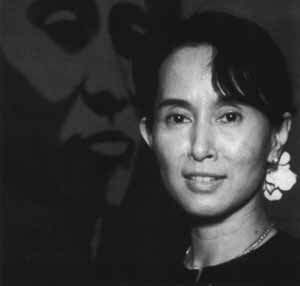 Suu Kyi was banned from standing in the elections after the junta designated her as a foreigner, citing her marriage to Aris. Suu Kyi’s party emerged with almost 60 percent of the votes, and made an immediate demand that the junta begin negotiations on a new assembly. The military insisted the elections were to choose a government that would operate under its direction and refused to recognize the result. The U.S. led the international response, imposing economic sanctions on the teak- and rubber-exporting nation of 53 million people. The sanctions, still enforced, have been undermined by Chinese, Indian and Thai investments in ports, railways and oil and gas pipelines that give them access to the country’s natural resources and trade routes in the Indian Ocean. The Association of Southeast Asian Nations called the vote “a significant step” in Myanmar’s path to democracy, according to a statement from Vietnam, which holds the rotating chairmanship. China welcomed the smooth election, Xinhua reported, citing Foreign Ministry spokesman Hong Lei.